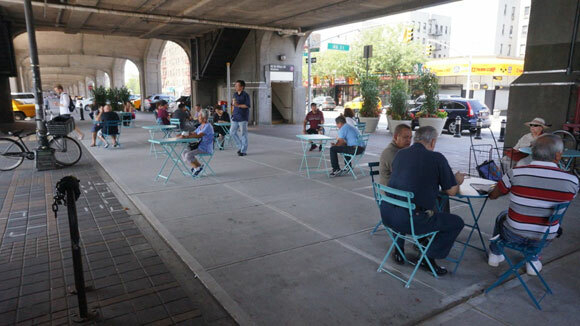 Two weeks ago, Council Member Jimmy Van Bramer cut the ribbon on Bliss Plaza, a new public space created with a few simple changes to the area under the 7 train viaduct at 46th Street and Queens Boulevard. Clarence sends these photos of the plaza in action this weekend: A nicer sidewalk surface, a few planters, and some moveable tables and chairs were all it took to turn this spot into a people magnet. The Sunnyside Shines BID worked with DOT’s plaza program to make this intersection a usable public space. It was already car-free but there was no place to sit until the BID came along. After hosting a few successful events at 46th Street and another car-free area beneath the viaduct at 40th Street, the BID knew it was onto something. A second plaza at 40th Street, to be known as Lowery Plaza, is in the works. This is such a better use of this space than for parking. Seriously, the space under the viaduct is prime urban real estate. It’s centrally located. By definition it’s near mass transit. It’s shaded in the summer. Why we don’t use the entire space for something else besides parking is beyond me. It would even make a great place to install a bikeway, provided we blocked thru traffic from the cross streets so it would be a continuous run. Heck, there’s so much space you can have both a bikeway AND plenty of pedestrian space, perhaps even retail establishments. I live in Sunnyside, and it’s amazing how quickly residents began using the plaza the day it opened. The pictures don’t do it justice. It is usually much busier than this, with more tables and chairs. The next step would be more lighting and a cleaner overall environment. I definitely prefer plazas to parking as well, but this particular plaza did not take away any parking. Local businesses used the installation of the plaza as a means to kick out vendors. There’s no reason why the plaza and vendors cannot coexist. Isn’t Plaza maintenance usually paid for with B.I.D. money? If so, I don’t believe vendors kick into that pot. It would be a fantastic place for an artist-designed light installation on the underside of the viaduct. I’d love to see whole blocks of parking removed under the 7 line. Turned into things like skate parks for kids, basketball courts, even an area with food trucks offering all sorts of fun items. Now that NYC DOT, Parks, City Administration sees people will use it we should continue the experiment. This plaza, and the proposed 40th street/Lowery plaza, are both in areas that do not accommodate parking. The blocks in between are mostly used for metered parking. If those intervening blocks could be converted into plaza space in order to create a continuous plaza running from 40th to 46th street, this would be an amazing mini-park, or spot for retail vendors, art installations, or some combination of those things. I think it’s a great start, and hopefully is the first step in returning the majority of this area to the public. Metered parking on nearby streets is typically not hard to find, although free spaces are, of course, in short supply. I was here Sunday and it’s great to see just how much calmer it is since I visited last year. The one thing about Bliss is that it has a fair amount of stores close by, Lowery doesn’t feel as busy. That’s not a reason not to build something just that planners may want to do something a little different to draw more people to this section.